For just a few hours on Thursday, you could walk on Mars without ever leaving Alumni Hall. In a partnership with Microsoft, NASA’s Jet Propulsion Laboratory developed OnSight, virtual 3-D technology enabling scientists to study Mars’ environment while wearing Microsoft HoloLens. NASA demonstrated the lens during the Frontiers public exhibit, one of five different events going on as part of the White House Frontiers Conference in Pittsburgh Thursday afternoon. The conference, a program jointly hosted by the University of Pittsburgh, Carnegie Mellon University and the White House, brought in researchers, professors, entrepreneurs, CEOs and President Barack Obama to share and discuss innovation. Kristin Lee, the communications director of the White House Office of Science and Technology, the White House wanted to highlight the latest innovations in such fields as artificial intelligence, personalized healthcare and climate issues. “We really feel that the purpose of today is to highlight the future of what’s possible and what America can accomplish over the next 50 years,” Lee said. The Frontiers exhibit — which ran from 9 to 11 a.m. and was the only event open to the public — featured projects and presentations related to the conference’s numerous fields including drones, robots and virtual realities such as OnSight. The event was on the first floor of Alumni Hall. The rest of the conference focused on innovation from five frontiers: personal, local, national, global and interplanetary. For each frontier, there were speakers and panel discussions from professionals working in the track’s theme. Steven Keating — now a graduate student research affiliate at MIT — entered medical school in an attempt to learn more about his own health and have access to medical data. After being diagnosed with brain cancer, Keating went through brain surgery to remove the tumor and then underwent a year of chemo, all the while asking questions and even requesting that his surgery be recorded. But Keating said he found it difficult to get any details about his treatment. “If we have easy access that is patient-centered and clear to use, we can drive the next revolution in healthcare from the ground up,” Keating said. Keating now works on developing novel platforms for 3D printing, but he spoke about the need for more accessible health care information during the personal track of the conference. The track focused on innovations in health and included speakers who work to make medicine more precise and patients more involved in the healthcare process. The keynote speaker, Dean Kamen, described the work at his own company, DEKA, where 500 engineers are working on improving technology for medical treatment, such as prosthetic arms and a redesigned wheelchair with self-balancing technology that allows it to navigate any terrain. Despite the progress made by Kamen and other researchers, panelist David Okonkwo — Pitt neurosurgeon professor and UPMC executive vice chair of neurosurgery — said failure is a common experience for researchers. Like a scene straight out of a science fiction flick, the IBM corporation’s computer program, Watson, beat two of Jeopardy’s winningest contestants at their own game in 2011. Guru Banavar, vice president of cognitive computing in IBM research, discussed Watson, as well as other advancements and possibilities in artificial intelligence during the conference’s national track in CMU’s Jared L. Cohon University Center. On top of being an impressive technological advancement, Banavar said Watson is also designed to be conversational and responsive. Other speakers during this track focused on the possibility of using artificial intelligence in such fields as medicine, transportation and wildlife conservation. Speakers were figures in computer science, medicine and engineering, with a focus on technological and policy developments and the challenges still faced in the field. Jennifer Magnolfi, a researcher at Programmable Habitats — a startup based in New York that explores the performative collaboration between humans and machines for assisting human performance — said her company focuses specifically on augmented human performance. Magnolfi highlighted the future of robot-human interactions, especially in the workplace, where the two might meet head-on. “We’re approaching a state where human workers will collaborate and even share spaces with various forms of machine intelligence or artificial intelligence,” Magnolfi said. In an op-ed for WIRED magazine, published Tuesday, Obama said he’s counting on humans to step foot on Mars by the 2030s. During the interplanetary track, speakers from NASA, SpaceX and Moon Express, to name a few, focused on cutting-edge technology that has changed space exploration. NanoRacks, a company that calls itself “the operating system of space,” provides commercial goods for use in the International Space Station and in low-range orbit flight. CEO Jeffrey Manber said the company has been able to deploy satellites using technology from Japan, shuttles from Russia and stations here in the United States. Other companies, including SpaceX and Moon Express, agreed that their projects are only the beginning of the privatization of space travel. The future, representatives said, lies in making space travel cheaper and more accessible. In the lightning talks between the panel discussions, astronomers and astrophysicists discussed the feasibility of occupying other planets, such as Mars. In a quasi-celebrity appearance, Eugene “Rod” Roddenberry — son of Gene Roddenberry, the creator of Star Trek — said at the session the appeal of Star Trek came from more than show’s scientific aspect. During his presentation at the environmentally focused global track, Eric Beckman, faculty member in the chemical engineering department at Pitt, said the University could play a huge part in fighting climate change. 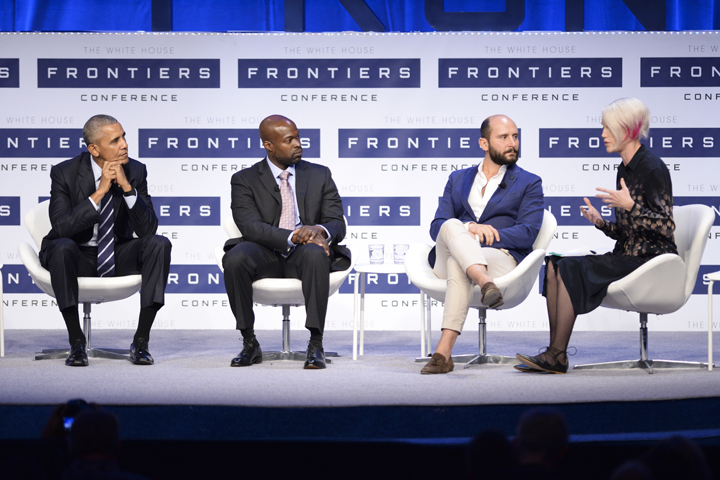 The global track of the Frontiers Conference focused on mitigating emissions through cutting-edge technology and advancing mission innovation. Speakers at the event ranged from political figures to chemistry and engineering professors to the company managers funding the technology, tools and design for a climate-smart future. Astro Teller, the captain of Google’s Moonshot Factory, gave the keynote address and asked the audience to “think broader” by putting more intelligence into innovations rather than seeking incomplete solutions. “A big chunk of how we, as a species, will get smarter about using the world’s research is by inserting more smartness in our world and [the] things we use,” Teller said. With the population of cities steadily growing, city planners, transportation officials and innovators are working to engage with citizens and to address subgroup concerns through shared data. This is especially true in Pittsburgh, where city officials have made open-access data more available to the public through programs like the Western Pennsylvania Regional Data Center. Pittsburgh police also announced at the Frontier’s Conference that it would join the White House’s Police Data Initiative to make policing more transparent. The presentation officially began with the event’s first panel: An Armchair Conversation on the Urban Transportation of the Future. The panel focused on making communities safer and wealthier through promoting a shared-vehicle economy and advancing the cause of the autonomous automobile. “States are laboratories of democracy. Cities have the potential to be labs of transportation,” said Anthony Foxx, U.S. Secretary of Transportation. Antwi Akom, the CEO of Streetwyze — a technology startup dedicated to bridging the gap between official and local data about cities through mobile platforms, reiterated Foxx’s message by talking about the importance of easily accessible local information in a lightning talk.